Working in the Londolozi Creative Hub definitely comes with its perks. Unlike office jobs in the city, we step out of our hub straight into the bush. In the past week on my walk to the Creative Hub (which takes me a total of three minutes) I’ve walked past a nyala calf sprinting around with its tail puffed up and in the air after just learning to walk; a new born vervet monkey balancing on a branch looking at its mother for reassurance; a creepy monitor lizard obstructing the pathway to the front door; and recently many tortoises crunching through dried leaves as they carry on with their business. Just like any ‘normal’ job we get a lunch break. 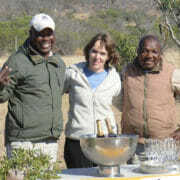 Recently I experienced an extraordinary lunch break as I was treated to a quick excursion into the bush. 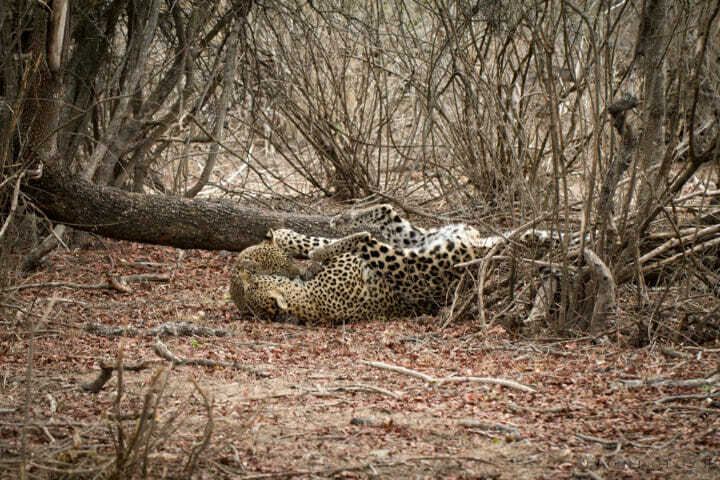 After gobbling down some lunch we set out to a sighting that had been found that morning, just outside of camp, where the Nkoveni Female leopard had hoisted an impala kill. 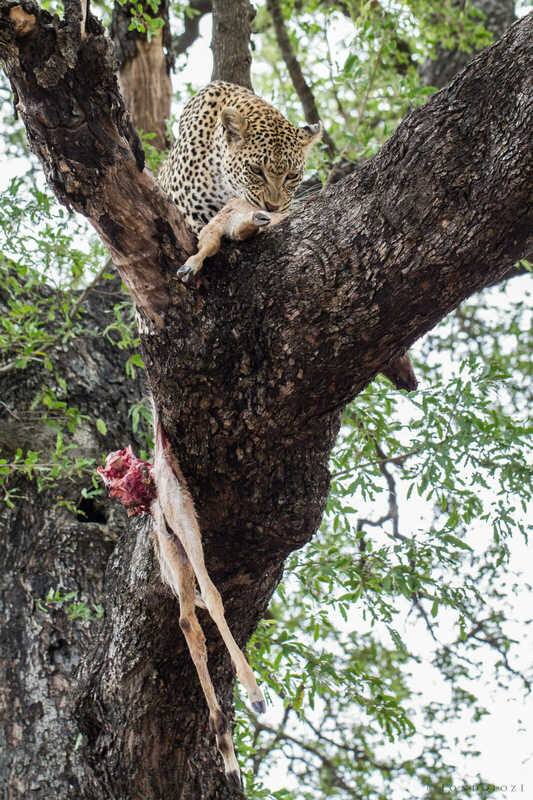 It’s always quite a morbid but exciting scene arriving to an impala draped over the branches of a Jackalberry tree, hanging by a few pieces of its skin. After turning off the engine and sitting in silence for a few moments, our eyes adjusted to her rosettes in the thicket. It always amazes me how long it can take me to spot an animal which, once you’ve seen it, seems as clear as day and you can’t believe you hadn’t picked it out immediately. We couldn’t see her cub however, and eventually settled on the fact that she might have been hidden somewhere. The adult female looked full and satisfied as she lay fast asleep in the shade, and it appeared as though we wouldn’t get much action out of her. But patience paid off, as it normally does out here. After a few minutes her sleepy eyes began to open. She started looking around and our hopes rose as we quickly scanned for her cub. Then came the best and most exciting part. Her mouth opened and she made a very low ‘aaaooow’ sound. She was contact calling for her cub! 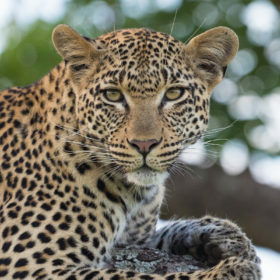 She called several times with no response and I started to worry that something had happened to the young leopard. 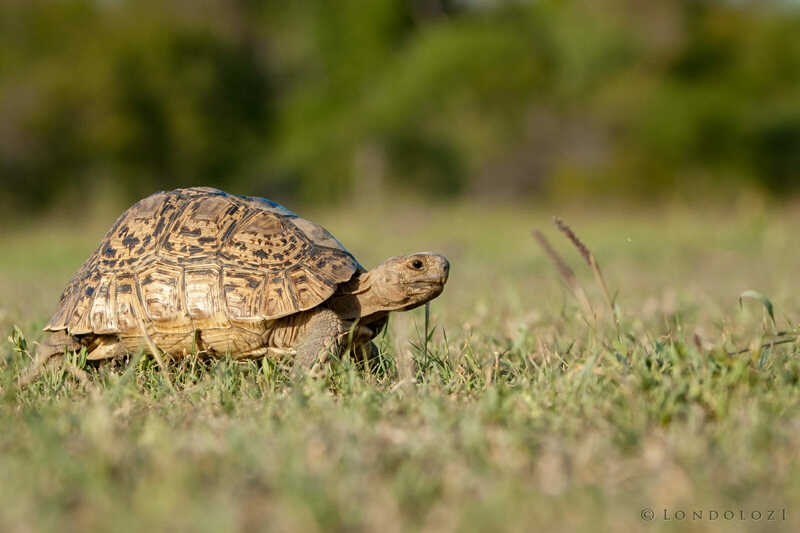 After a while we heard a faint sound come from a thicket nearby and soon enough a little body came trotting out. 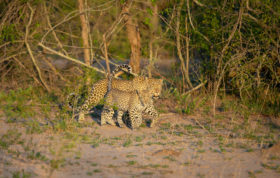 As the mother approached her cub, the playful nature of the young leopard was triggered, and she hid behind a termite mound. 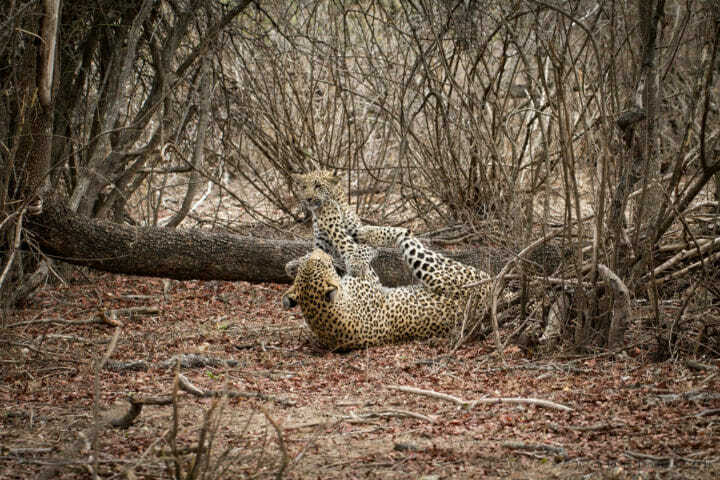 As her mother came closer, the cub hugged the ground even more tightly and then suddenly with the greatest spring, she pounced! They greeted each other with head rubs and their bodies and tails brushed against each other affectionately. For a good 20 minutes we watched as these two played and played and played. It was the most adorable thing to see, and it was evident what a good and patient mother the Nkoveni female is. 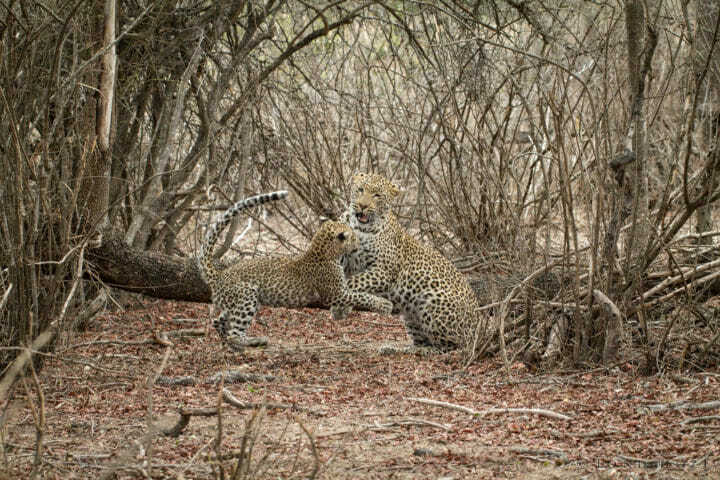 If leopards could express happiness and fun, these two would be the epitome of it as they tumbled around and pounced on each other. Eventually they became tired and it was clear that they had worked up an appetite. I find this image of the adult female quite humorous as she lies on a log with all four feet still on the ground. 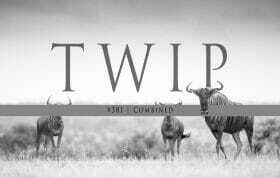 The mother began to look up into the tree where the almost forgotten impala lay. 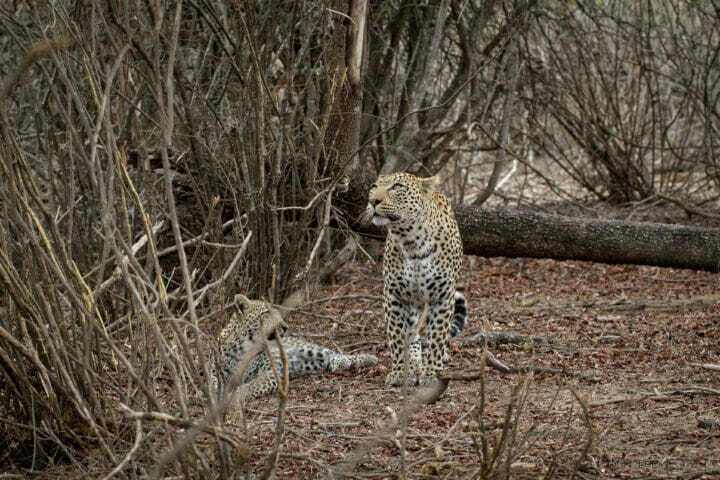 Just as it was lunch time for us, so too was it feeding time for the leopards. The cub started peering up with envious eyes, but she waited for her mother to feed first. 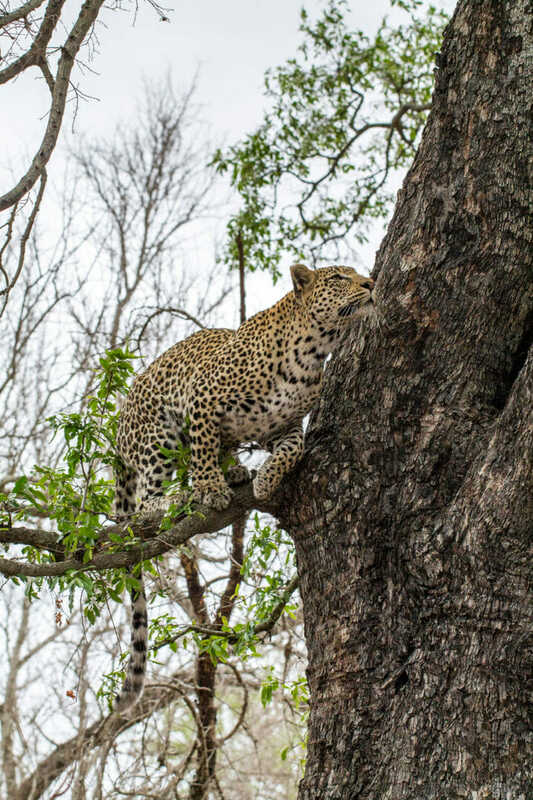 For the second time in my life I watched a leopard climb a tree, and again I was gobsmacked at this remarkable scene. The ease and grace with which she scaled the vertical trunk was utterly beautiful. She was a rather noisy eater, and we could hear her scissor-like teeth cutting the meat of the impala as tufts of the antelope’s fur feathered down onto the ground. The cub patiently looked up at her and occasionally rolled over in the dry leaves enjoying the dappled sunlight. I looked at the time and it had flown; we needed to head back to camp. As we drove back, I thought to myself that it’s moments like these where I am so grateful for living where I do. Working in the bush is truly unpredictable and breathtaking and as I carried on with my daily routine it becomes more evident how structureless and variable life is just outside the Creative Hub doors. I encourage you all to do something different with your time off, exploring new places and creating new adventures, life is too short not to. 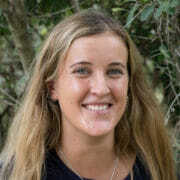 Wow Jemma, an amazing experience. All I could think of while reading your blog was what a wonderful memory you were making and what a joy it must have been watching these two play! The Nkoveni has been my favorite since birth and her mother, the adored Mashaba, leads the way in most hearts. Although green with envy, I’m VERY happy for you! Green is a good holiday color, right? Lol…. A little different from watching yellow taxis pass by in NYC at lunch! I also love watching the interplay between moms of all species and their youngsters, the most unusual of which for us was a rhino “family” sighting. 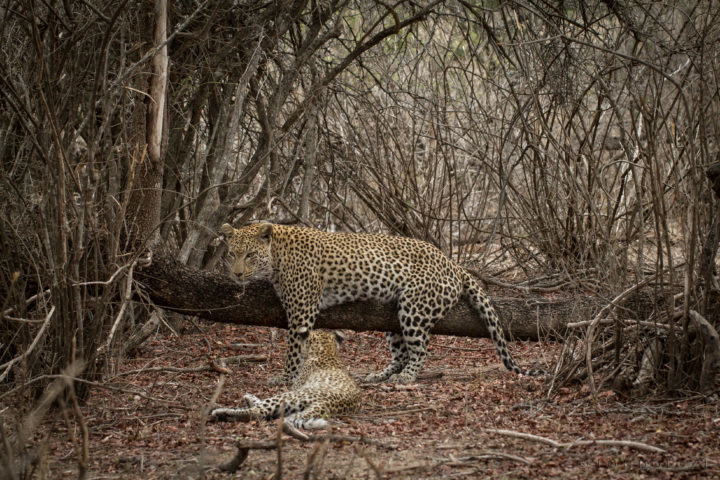 While in Londolozi we observed many leopards lazing around or walking through the bush. 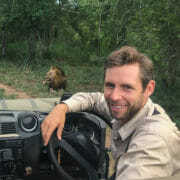 But we did experience three lions dining on a downed kudu. The law of the wild. 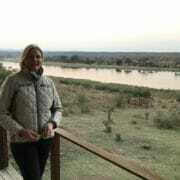 Amazing times in Londolozi! Great story and great photos! Thank you Jemma! What a lunch break! What an adventure! I wish I had that kind of lunchbreaks! Fantastic! Thank you for sharing your wounderful pictures! Lovely blog and photos, Jemma. I was also lucky enough to spend some time watching these 2 playing in October, and felt deeply privileged. It’s the best kind of break when you can sit back and watch the interaction between mom and cub. 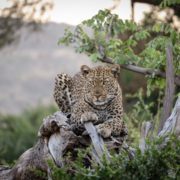 Spotting a leopard is exciting in itself but to have experienced all of that within a lunch hour is extraordinary, to say the least. You can’t plan for what you want to see, just go with what nature gifts you. The most magical way I could think of spending a lunch break!